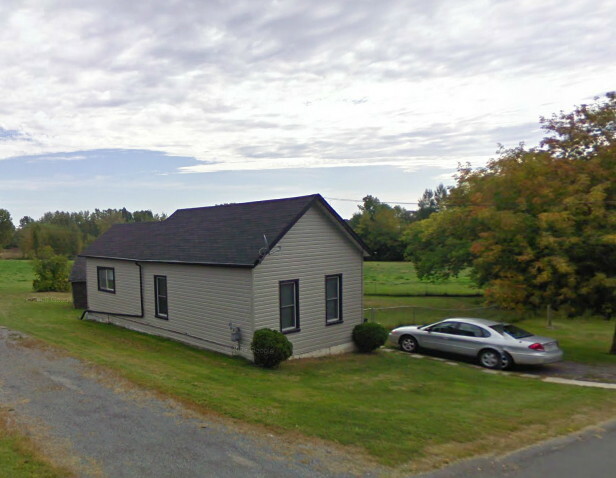 This small house on First Street in Deseronto looks to have an idyllic location nowadays: no immediate neighbours and a pleasant view of open fields behind it. 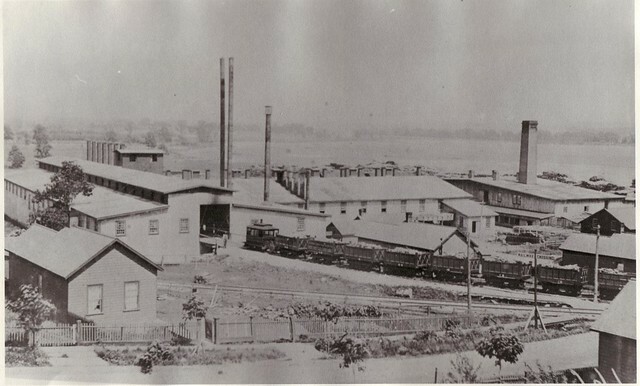 The works was in operation from 1887 until 1898, when it was destroyed by fire. As the house was so close to the buildings of the terra cotta works, it was fortunate to survive the blaze itself. In the summer of 1907 Harold McMurrich Rathburn took a trip across Canada from Deseronto to Edmonton. He took his camera with him and Deseronto Archives holds the negatives that Harold made. Luckily, the negatives were kept in two albums which were indexed by their owner, giving us useful information about the subjects of each shot. His journey took him first by steamer from Owen Sound to Port Arthur (now Thunder Bay). Below is the view of the American Soo Canal that he shot from the deck of the Canadian Pacific Railway’s steamship Alberta near Sault Ste. Marie. Harold and his companion, Harry Jones, seem to have made some business-related visits while in Port Arthur. The picture below shows them standing with another man in front of an elevator which belonged to the Canadian Northern Railway. 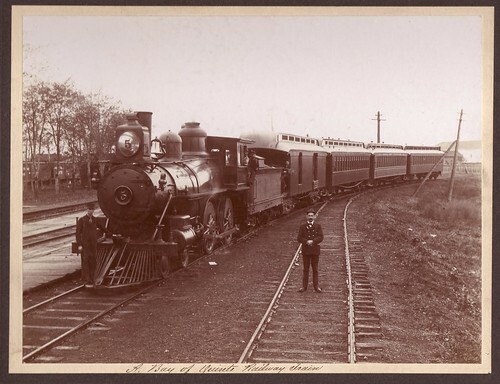 At this time, the Rathbun Company ran the Bay of Quinte Railway in Deseronto and surrounding areas, so this visit might have been related to the company’s railway interests. "Harry & H.M.R. at C.N.R. Elevator"
The two men continued their journey on the Canadian Northern Railway which had reached Edmonton two years previously. Harold took photographs of a number of buildings in Winnipeg and Edmonton and also several snapshots at Warman Junction in Saskatchewan, including this charming photograph of a group of men watching a boy with a gopher. 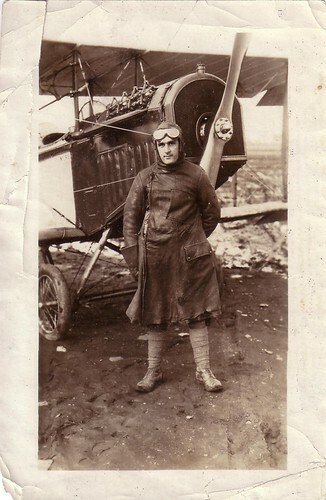 "Boy with gophir at Warman Jct." We are gradually digitizing all of the Harold M. Rathbun negatives and many of them are now available on our Flickr pages. Many archivists and local historians view their environments through an historical filter. We see what is there now, but there also is a strong awareness of what was there before. The view below is of the junction between Main Street and Mill Street in Deseronto as it appears today. One might think that this is just a quirk of historians and archivists, but recently, through our Flickr account, we became aware that other people have this habit of looking at townscapes with this past-filter in place. In this instance, the point of view is that of a railway enthusiast: one who has spent a lot of time imagining the town with its early twentieth century railways and industrial sites still functioning. Not just imagining, either: this particular enthusiast has re-created the town in this image, in the form of a railway simulation. Deseronto Spur- This is roughly 8 miles long and will be the first part of the route that I will finish. It will be modeled as a dilapidated branchline serving several industries in the town of Deseronto. …I have tried to make it as accurate as possible… Some of the industries here will include a frozen food cannery, a steel fabricaton plant, an agricultural co-op, team track, and a lumber yard. Jason has shared a large number of screenshots on the Train-Sim forum and it is a really intriguing mixture of imagination, creativity and history. Particularly since Jason is 15 years old and having to cope with a fair amount of school work as well as this project. Thanks to Jason for sharing his simulation and for acknowledging the Archives as a source of useful information! We have no information about the men in this picture, so if you can help identify them, please leave a comment, either here or on the Flickr page for this picture.